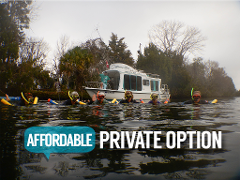 This private option won’t break the bank and delivers a personal touch that you simply can’t get on a larger tour. 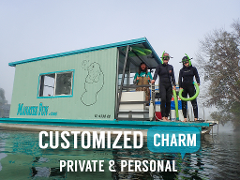 Our enclosed Fun Houseboat seats up to 6 comfortably and we include everything you need for the tour at one low price. 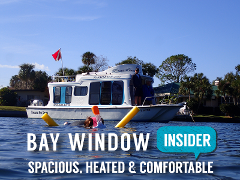 Crystal River’s best kept secret delivers the experience of a high end semi-private tour at an affordable price! This adventure is 3 hours from start to finish and is only available for up to 6 participants. Our manatee snorkel tour is not to be missed! Our premium private houseboat is a comfortable ride, with heat, bathroom, snacks and hot cocoa. Specialized for you and the ones you choose! Our manatee snorkel tour is not to be missed! Doing it with a small group of like-minded individuals makes the experience even more breathtaking! 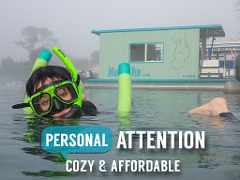 Our semi-private houseboat is a comfortable ride, with heat, bathroom, snacks and hot cocoa.